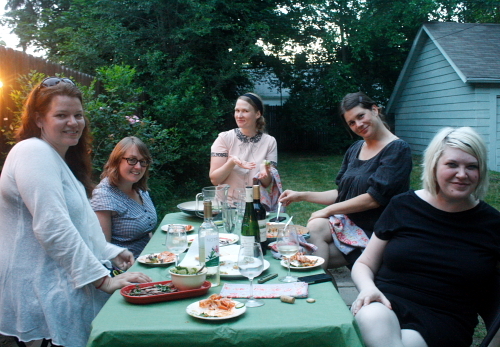 After a few months’ hiatus, les culinettes (a potluck dinner club of like-minded ladies) was back in full force a few weeks ago with a red-themed dinner at Emily’s beautiful Woodbridge home. Because of the length of time that passed since the last dinner (September! yoinks…), we were all extra-excited and inspired this time around. 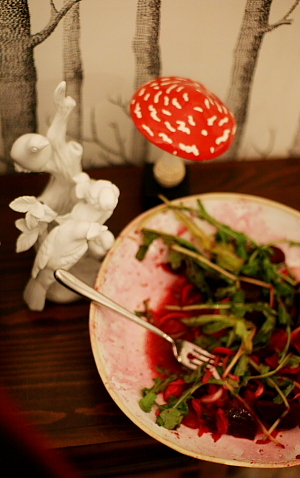 Since the green-themed dinner went over so well, Emily decided to do a similar theme but with red food. Once again, I was impressed by the variety and breadth of people’s contributions- red pepper hummus (Emily), an African curried chickpea stew (also Emily), Spanish stuffed ancho chiles (Abigail), a salad with lots of red accents (Meghan), beet ravioli with brown butter & sage (Sarah), roasted red pepper & tuna tapas (Amy), fries with homemade ketchup (Christina), a red onion vegetable tart (Molly), and even cherry-pomegranate bourbon jello shots (Molly again)! You’ll forgive my phone photos, I hope… I forgot to bring my camera, but can’t resist sharing some shots of this amazing food. I had a bunch of pitted tart Michigan cherries in the freezer left over from some Beau Bien jam-making, so I offered to bring dessert. I made a buttermilk ice cream, and to go on top, cherries in a light syrup infused with vanilla and a touch of cinnamon. I thought it might be nice to have something to soak up all the sauce, so I also made shortcake-type biscuits, and sprinkled them with a little red sugar to get in the spirit of things. By the time we got to dessert, I was shocked anyone had room left, but then again, I always am! Luckily everyone rallied, since it would have been a difficult dish to take home for later. Sarah had a couple visitors in town from Chicago who were couch-surfing for the weekend, so she asked if she could bring them. Of course with that much food, it was almost a relief to have extra mouths to help us eat it. I was seated next to Romain, a visitor from Berlin who is spending a few months in Chicago. We chatted about European vs. American schools, travel, and how cheap cities facilitate art and musical creativity and entrepreneurship (he’s originally from an industrial town that also has suffered from lost jobs and subsequently abandoned areas of town). It’s always interesting to see Detroit through a first-time visitor’s eyes, especially one from another country; the point of view around here can verge on myopic (tending to eternal pessimism on the one side and relentless boosterism on the other) and it’s great to get some perspective. Dessert was served with some exciting news from one of the guests, which I won’t divulge here but which had us all toasting and cheering. Ending the evening on that high note, we bundled up and headed to our cars with the warm glow of contentment. If you can’t wait for tart cherry season (and who could blame you), try to hunt down some frozen tart cherries for this. You could use sweet cherries, but I’ve always found them rather insipid for cooking, and the tartness of the sour cherries pairs so well with the buttermilk. I used this ice cream recipe from Smitten Kitchen via Claudia Fleming’s book The Last Course, using 6 egg yolks and adding about a half teaspoon salt, and a recipe for shortcake biscuits from Martha Stewart’s Baking Handbook. If using fresh cherries, place them in a bowl with the sugar, mash lightly with a fork, and allow to macerate 30 minutes or so, until they begin to release their juices. Place cherries, sugar and vanilla bean in a medium saucepan. Simmer gently until the cherries begin to break down and the liquid becomes slightly syrupy, about 20 minutes. Remove vanilla bean and add a pinch of cinnamon to taste. Serve warm over buttermilk ice cream and shortcakes. Summer tomatoes may seem like an odd thing to post about right now, as most other North American food bloggers are fully in fall’s sway. But now that I have this silly wedding business behind me, I’m catching up with a few odds and ends- blog posts I’ve been sitting on; photos I’ve been meaning to edit; recipes I wanted to share. 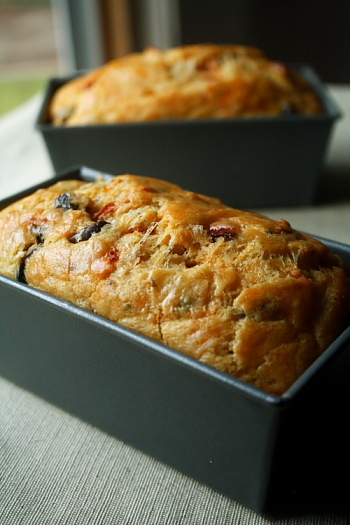 Besides, the particular recipe I have for you today- a savory zucchini-tomato bread- is actually more suited to this time of year, because who wants to turn up the oven on a sweltering August day? (Oh, that’s right, I did.) This bread, though- if you still have a glut of zucchini but are tired of sweet zucchini bread, this is the ticket. It’s rich, eggy, cheesy and perfect for a cool fall day, and it keeps for a few days because of how moist it is. 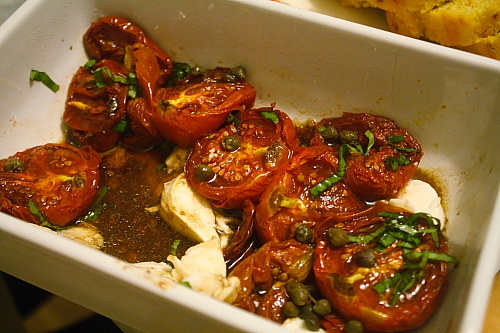 Also, if you’re grabbing bushels of Roma tomatoes to make these roasted Romas, this is a great use for them. 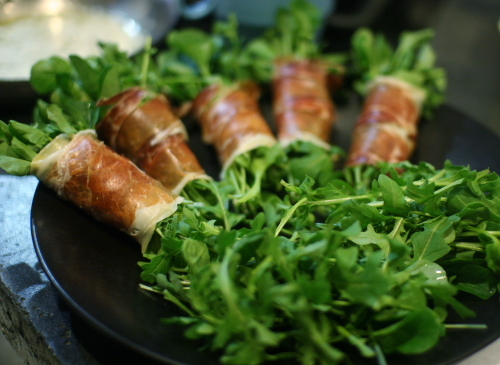 Mine were from last year (roasted and frozen in olive oil) but they held up beautifully. If you don’t have tomatoes you can throw in a handful of black olives, or even a little diced ham. 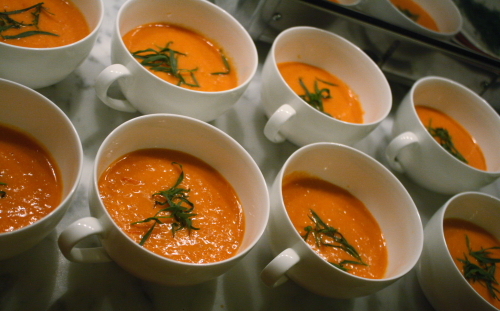 The last meeting of our cooking club took place on August 12 and as we have a seasonal bent, we celebrated the tomato. Once again, I wondered how we would pull off 8 or so dishes with the same ingredient in common and not have it be “too much”, and once again, I needn’t have worried. From just-picked to barely cooked to long-simmered to roasted, the permutations were as creative as they were delicious. 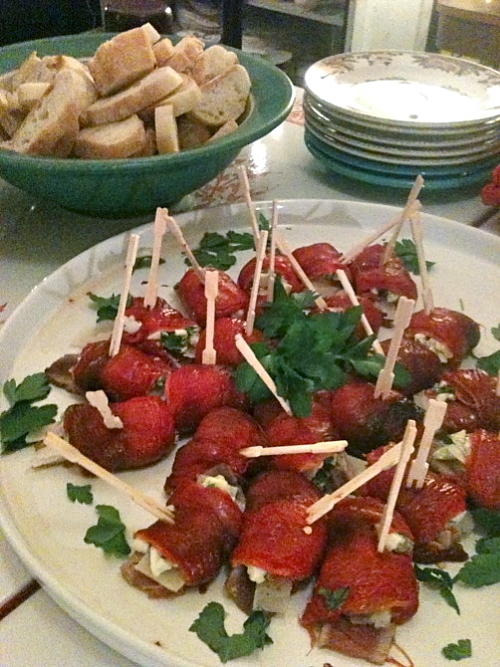 Sarah skewered fresh tomatoes with melons, basil and mozzarella for a salad on a stick. Molly puréed tomatoes from her garden with peaches and a little yogurt and garnished it with tarragon for a chilled summer soup, a riff on a Mark Bittman recipe. Amy, ever the fancy-pants (I say this with the utmost admiration! 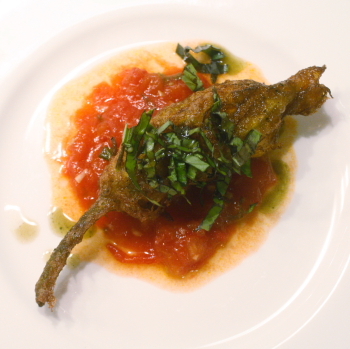 ), stuffed squash blossoms with seasoned diced eggplant, fried them and set them on a bed of barely-cooked tomato sauce. Heavenly. Speaking of heavenly, I want to digress just for a moment here to talk about our hostess Abigail and her stunning Ann Arbor home, which you can see a tiny glimpse of in a couple of these photos. I hope it doesn’t embarrass her if I say that I was absolutely enamored with her house and its decor, a perfect blend of old world/antique and whimsical modern. The house itself is in amazing condition, with original woodwork throughout, a gorgeous fireplace and many other cool details. And the landscaping- let’s just say gardening is Abigail’s labor of love, and it shows. Much of Abigail’s decor, including the “most beautiful chandelier in the world” (as she told her husband to convince him they needed to buy it and ship it back) was purchased during their time living in Italy. I’m guessing the heavy linens on the dining table were of European provenance as well- you just can’t buy stuff like that at a department store. Of course it’s no surprise that such impeccable taste would carry over to the kitchen. Our hostess made two knockout dishes, one an appetizer with multiple components, the other a homey potato gratin (in a vintage enameled casserole, no less). 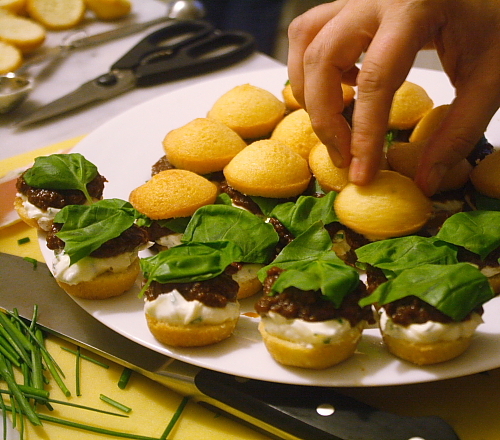 The appetizer was composed of a whipped chive goat cheese and a deeply savory tomato-shallot-vinegar compote topped with a basil leaf, on little almond biscuits. The sweet cookie-like biscuits were unexpected but totally worked. It was a struggle not to devour too many, as we all wanted to save room for dinner. It’s been well over a month since this dinner and I’m struggling to remember what Emily and Meghan brought- please forgive me, ladies! I believe the roasted tomatoes with capers and mozzarella were Meghan’s contribution, and Emily brought a simple salad of tomatoes from her garden. She was understandably much too busy to prepare anything more complex (not that she needed to anyway), as she was getting married the following weekend. Congratulations Emily! I don’t think I would have even been able to attend any social events the week before our wedding, as I was so busy taking care of last minute details, but she seemed much more organized than I. As usual, we had a grand old time eating, drinking and making merry. We were privileged to have been joined by Abigail’s old school friend Chiara, who was visiting from Brooklyn on her first weekend away from her kids. I hope we showed her a proper good time. Kids, if you’re reading, she was fighting back the tears pining for you the whole time. Really! Some say a bride experiences a let-down after the wedding, when there is no longer a big event to focus on, and the attention dwindles. I don’t feel this way in the slightest, at least not yet- on the contrary, I’m really excited to have time once again to cook and have dinner parties. I will of course post about the wedding very soon, once I get our photos and have some time to digest everything, so to speak. 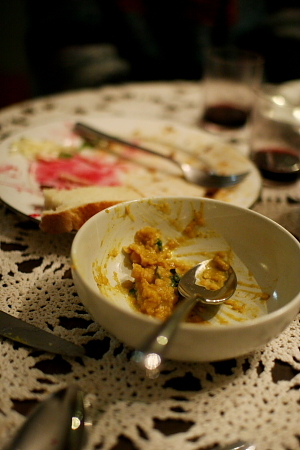 The ultra-short summary is that we had the time of our lives and the food was to die for. 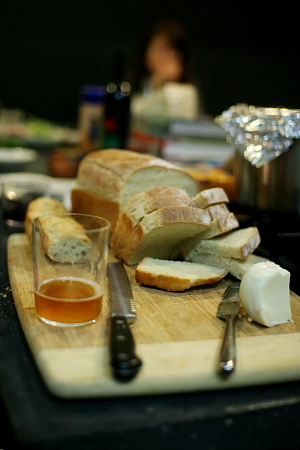 But I can’t wait to get back in the kitchen, so here’s hoping we’ll plan another Culinettes party ASAP! The inspiration for this recipe is the savory “cakes” served in France as part of the apéro (pre-dinner drinks and snacks). The first time I made it, I used roasted tomatoes and black olives, but wanted to adapt it to make use of the overabundance of zucchini in gardens and markets at the end of summer. The results are a delicious departure from sweet, muffin-like zucchini breads. Preheat oven to 400°. Grease 2 loaf pans or four mini loaf pans. In a large bowl, whisk together the flour, baking powder, cheese, salt and pepper. In another medium bowl, lightly beat the eggs with the wine and olive oil. 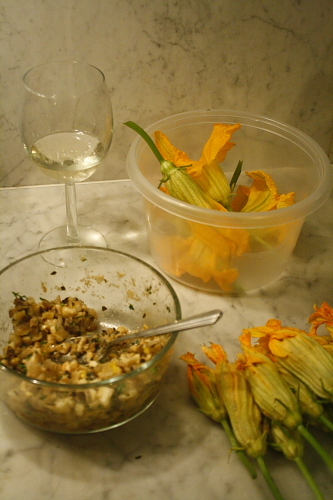 Make a well in the center of the dry ingredients and pour the egg/wine mixture in. Slowly mix the dry ingredients into the wet until fully incorporated; do not over-mix. Lumps are fine. Fold in the vegetables and rosemary. Divide the batter evenly among the pans and bake until the top is golden and crusty and a toothpick inserted in the center comes out clean, about 45-50 minutes for small loaves and an hour for large loaves (please note that I didn’t make large loaves so I can’t vouch for the timing- keep an eye on them and test to be sure). 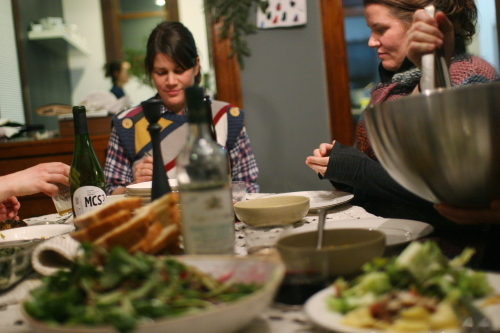 In June, I had the honor of hosting les culinettes, the cooking club I’ve been participating in for the past few months. Back then- a whole month ago!- my schedule was just free enough to accommodate a dinner party, but as the weeks fly by and freelance work* and wedding planning have been ratcheting up, blogging has sadly been relegated to the back burner (non-intended food pun, I swear). *I’ve been developing and testing recipes for holiday food the last several weeks… strange but fun! But rather than lament my absence here, I’d prefer to reflect on what was a beautiful balmy spring eve with good friends and great food. Our theme was “green”, in honor of fresh green vegetables finally being in the markets. Seems funny to think of it now, with temps in the 90s all week, but in mid-June we were just starting to see peas, asparagus and the like. 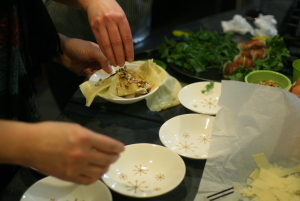 Several people did use spring vegetables in their dishes, but the menu was surprisingly diverse, with others interpreting the “green” theme more loosely. I had gotten up at 7am that day to get the house in order; in addition to cleaning, I wanted to hang a few pictures and curtains (nothing like company to get you motivated to do things around the house… I should entertain every weekend, I’d be so productive!). I was a machine all day, with just enough time to start getting my dishes ready as the dinner hour approached. Fortunately the theme wasn’t the only thing that was loosely interpreted, as most of the ladies arrived about 45 minutes after the appointed time, giving me a welcome opportunity to chill in the kitchen with a glass of wine and prep my food a bit more leisurely. 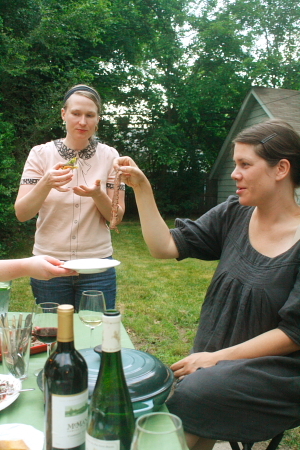 We decided to break up the meal into courses and eat the first round outdoors- it was one of those warm evenings with the barest of breezes, that elusive weather we long for in the depths of winter’s chill and summer’s scorch. The food was sublime, in every way a worthy match for the splendid weather. For appetizers, we had pea pesto and pea hummus on crostini made by Meghan, and a gorgeous grass-green fava purée topped with feta and kalamata olives that Abigail made with favas from her garden. The favas, which we spread on Zingerman’s baguette (only the best! 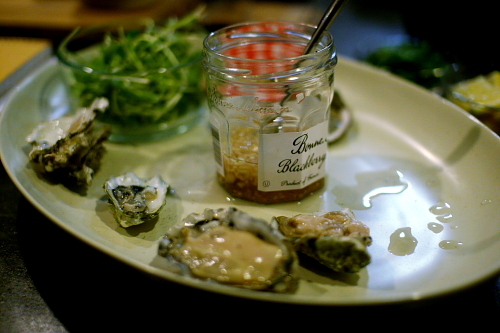 ), had the most amazing velvety texture that I was obsessed with, and a little spicy kick. Also served in the first half of dinner were pieces of flank steak with an uber-garlicky, emerald green chimichurri that Sarah made, and a shrimp dish in a light citrus sauce with basil and capers brought by Amy that I had to force myself to stop eating so I’d have room for the remaining two courses. 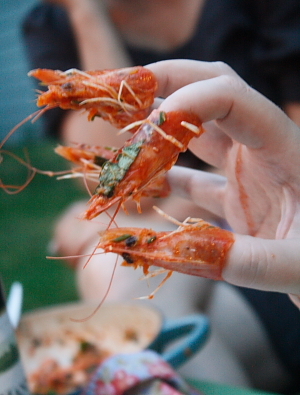 She had gotten the shrimp at an Asian grocer and they were huge and tasty; their heads lent flavor to the sauce, as well as providing some mid-meal entertainment. As it got dark, we headed inside as the mosquitoes started to make themselves known and spoil an otherwise lovely setting. Marvin had cleared off our little patio (the previous owners had seen fit to use it as storage for a large pile of logs for the fireplace), and set up a table for us as well as some string lights to lend a bit of ambiance. Thanks hon! Our designated dessert-maker Jess was out sick so we missed out on her green tea desserts (those in Detroit can sample her wares here though), but we were all plenty sated by the end of the meal. It being Friday, some of the ladies had worked that day and we petered out a bit earlier than our usual midnight-ish, but between the food, the company and the perfect temperatures I wouldn’t have changed a thing. Greatly anticipating our next gathering chez Abigail to fête the venerable summer tomato! I threw this together on the fly because I had some kaffir lime leaves to use up. 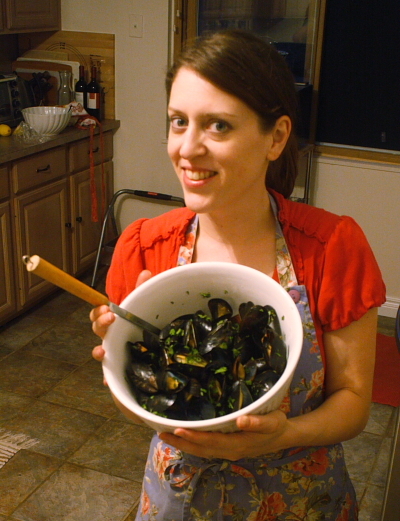 Technically the summer months are not supposed to be a good time for mussels, but the ones I purchased were fine. If you’re unfamiliar with purchasing, storing or cleaning mussels, this article is very helpful. 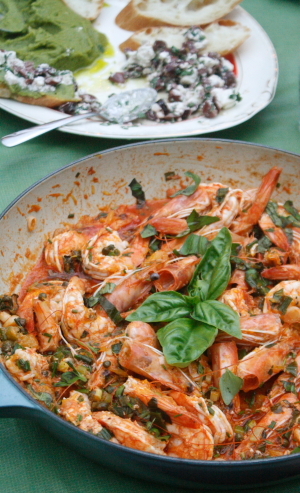 This sauce could be used to simmer a pound of shrimp or scallops as well if you don’t want to wait for mussel season again. 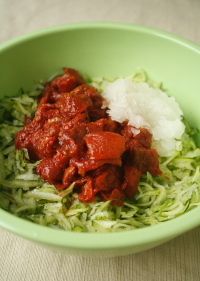 To make it a meal, just add some rice and a grated carrot or cucumber salad. Heat the oil (enough to thinly coat the pan) in the widest and shallowest pan you have that has a lid. Add the shallot, garlic and all but 1 Tbs of the peppers and sauté over medium heat until the shallot becomes translucent. Add the coconut milk, sugar and lime leaves. Cook at a very gentle simmer for about 20-30 minutes to infuse the flavors, stirring occasionally. 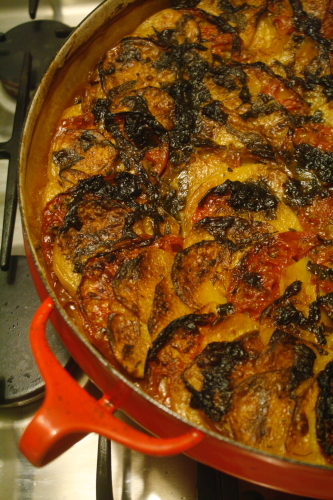 If the sauce gets too thick, add a splash of water, or cover the pan to prevent further evaporation. 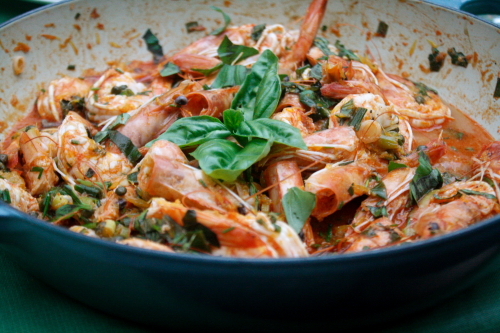 After the sauce has cooked down, season with fish sauce to desired level of saltiness. Raise the heat to medium high and add the cleaned mussels to the pan. Cover the pan and cook, shaking the pan a few times to allow more even cooking. The mussels are done as soon as they have all opened. (There may be a few stragglers that don’t open; these should be discarded.) Sprinkle the fresh herbs and remaining chiles on top of the dish and serve immediately in shallow bowls with some of the sauce spooned over. Serves 4-6 as an appetizer or 2-4 as a main course. 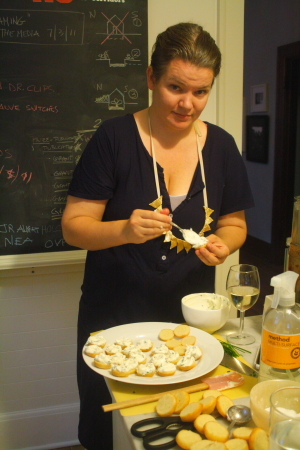 A few months ago, I got an email from my friend Sarah, inviting me to participate in a cooking club with about 5 or 6 other ladies of her acquaintance. Although I hesitated to add more commitments to my already busy schedule, I’m so glad that I did- these gals can cook! Although I was unable to attend the first dinner (I think I was playing a show that night), I received a charmingly decorated envelope in the mail from my friend Amy, who had gotten crafty and made us all little badges that said “les culinettes”. I was smitten. 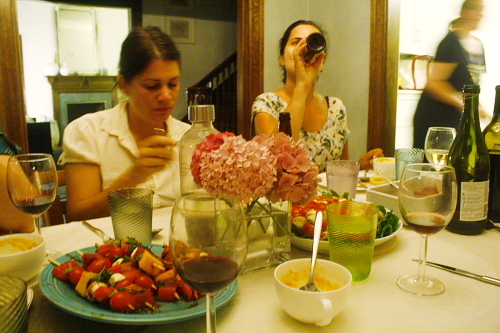 Luckily the next dinner presented no such scheduling conflicts, so a month or so later I got myself to Meghan’s adorable Victorian home in Corktown, where the theme of the evening was “peasant food”. I think any actual peasant would have just about keeled over knowing we considered wild boar ragù, fresh oysters and Pasta Kerchief “peasant food”, but hey, a loose interpretation of the term is fine in my book if it means I get to eat incredible food. The problem, if it can be called such, of a potluck like this is that unlike most dinner parties that feature one or two fancy “centerpiece” dishes and then more humble sides to go along with them, almost all of these dishes were showstoppers in their own right. 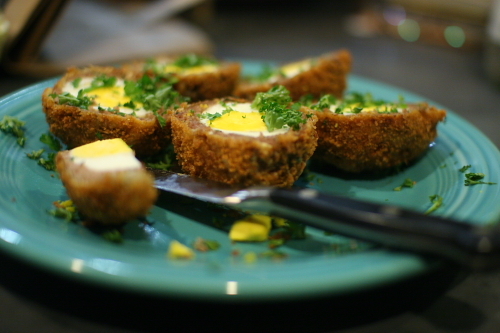 The Scotch eggs were perfectly browned and crunchy; the ragù deeply savory and tender; the pasta kerchief delicate and rich and utterly delicious. I left feeling like if I never ate again, I could die happy. About six weeks later, the group met up again, this time at Jess’s cool high-ceilinged second story vintage flat above a gallery in Corktown for a curry-themed dinner. I’m still awaiting copies of the photos from this gathering, having remembered my camera but forgotten to insert the memory card, but hopefully I’ll post on that eventually (along with the recipe for an awesome and easy Malaysian goat curry I made). 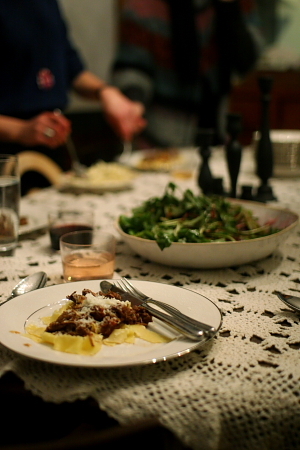 Meanwhile, if you’re looking for a snazzy spring dish, I highly recommend that Pasta Kerchief recipe, which I’ll be cooking myself at the first opportunity. We’re getting together again this Friday and this time I’m hosting- I’m a little nervous as this is the first time I’ve had more than one or two guests over in the new house and I still feel like we’re not “ready”, but what better excuse to just dive in. Besides, if this dinner is anything like the others, everyone will be concentrating too much on the food to notice that we haven’t hung curtains or that the bathroom tile needs re-grouting. Right? 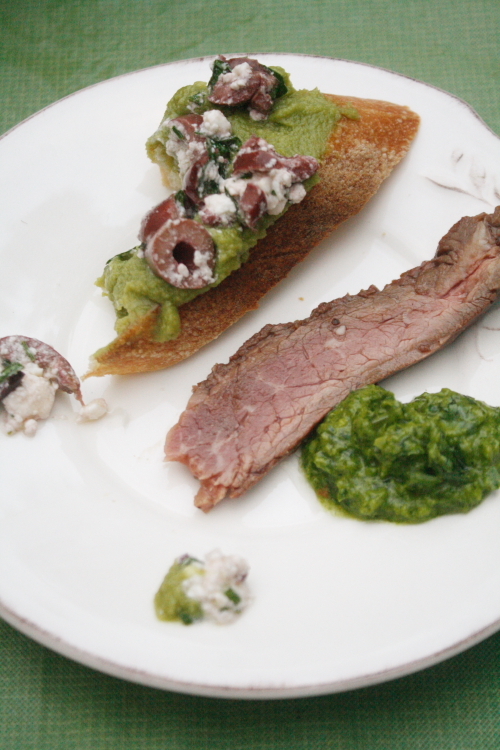 Our theme this month is “green”, and I was afraid we might end up with mostly vegetable dishes, but there’s talk of flank steak with chimichurri, ceviche, spinach pesto pasta, basil curried mussels and green tea desserts. Can’t wait to see what the ladies will rustle up! Thanks to Sarah Burger for photos- we were both taking pics with her camera and I no longer know who shot what, but some of the above is her handiwork!